people who are looking to retire. take hours – not only of the advisor’s time, but of our time as well. multiple options, we found Comrex. studios with Comrex ACCESS, and developed a BRIC-Link kit for the field. and reliable enough to form the basis of our remote kit. 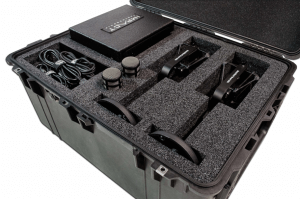 shipped in a custom Pelican case, the interior of which is molded to fit the equipment. saved days worth of time, both for our customers and for our engineers. very quickly. The portability of the BRIC-Link contributes a gigantic portion of that. E.C. Hamilton is the studio engineer for Impact Partnership. This story was originally published in Radio World. How could you innovate with BRIC-Link? Learn more here.